The International Raoul Wallenberg Foundation launched a worldwide campaign to determine, once and for all, the fate of the Swedish diplomat. The signatures obtained will be submitted to Mr. Vladimir Putin, the Russian President, and to the General Secretary of the United Nations, requesting the elucidation of one of the most controversial cases in history. Tom Lantos, the North American Congressman and his wife Annette, both saved from the Nazis by Raoul Wallenberg, lead the signature campaign. More than two hundred people attended the premiere of the musical ”Wallenberg”, based on the life story of the Swedish diplomat. Amidst those present was Marjorie Bloomberg Tiven, sister of the Mayor of New York and Commissioner for New York before the United Nations, as well as diplomats representing the following countries, Hungary, Switzerland, Germany and Italy, amongst others. A tribute to Wallenberg was played in front of the monument in his memory placed in the city of Tel Aviv. Between those present were Gabriel and Daniel Sykora, whose grandfather, Joel Sykora, had been saved by Wallenberg. Survivors saved by Wallenberg in 1944, placed flower arrangements in front of the Wallenberg statue, as a token of respect and remembrance for the vanished hero. The Hungarian Wallenberg Association organized a celebration in the new Museum of the Holocaust in the presence of Louise von Dardel, Wallenberg’ s niece. Students from the Raoul Wallenberg High School held an artistic show upon the stage. The Principal Headmistress of the Uruguayan ORT School, Mrs. Charlotte Grunberg, placed flowers in front of the monument that honors Wallenberg’s memory, in the city of Montevideo. Samuel Tenembaum, representative of the International Raoul Wallenberg Foundation in the Far East, held a work meeting with the Swedish Ambassador, in the capital city of China. Archbishop Hutchison, Canada’s Primate of the Anglican Church, spoke a few words during the event sponsored by the Swedish Embassy in Canada. In St. Kilda’s Superintendence, tribute was rendered to the memory of Raoul Wallenberg, in the presence of a Swedish representative. This meeting was headed by the Mayor of Port Phillip and by Dr. Frank Vajda. The people responsible for the erection of the ”Wallenberg” monument in Bratislava got together in Slovakia’s capital to dedicate a prayer to the Swedish diplomat. Thanks to the International Raoul Wallenberg Foundation’s cooperation, the Raoul Wallenberg School in Ecuador has begun the building of new installations, which will include a sports field, a swimming pool and science labs. Public summons to people who might have specific information on the whereabouts of Raoul Wallenberg, so as to be able to send him back to his home to be reunited once again with his family. All information must be sent to Raoul Wallenberg’s brothers and to the Swedish and Israeli Foreign Offices. The Argentine founder of the International Raoul Wallenberg Foundation, Baruch Tenembaum, has been a constant driving force in improving the dialogue between Jews and Catholics. He considered the day of the private audience granted by the Pope to 160 rabbis and Jewish representatives of all over the world as a ‘historical day’. The above mentioned visited the Pope to thank him for his contribution towards the reconciliation between the sons of Abraham and the struggle against anti-Semitism. The Jewish Community in Berlin and the International Raoul Wallenberg Foundation co-sponsored a ceremony during which Rabbi Dr. Nathan Peter Levinson was awarded a prize for his untiring actions in favor of an interreligious dialogue. The prize was handed over by Mr. Baruch Tenembaum, founder of the International Raoul Wallenberg Foundation. Rabbi Levinson founded the University of Jewish Studies in Heidelberg; during 20 years he was co-president of the German Council of Christian-Jewish Cooperation and since 1976 he was president of the International Council of Christians and Jews, of which at present, he is the honorary vice-president. Diocesan Bishop Carlos M. Franzini gave Jorge Buchitari, Parson of Tacural, who has the responsibility of looking after the synagogue of Las Palmeras, a precious and unique canvas. The piece of art, a reproduction of a mural executed by the great painter Raul Soldi in the Basilica of the Annunciation in Nazareth in 1968, was a gift that Mr. Tenembaum had given Bishop Franzini during that locality’s centennial. The Portuguese diplomat Aristides de Souza Mendes, who saved the lives of approximately 30.000 Jews and other people during the Holocaust and, Luis Martins de Souza Dantas, Brazilian diplomat who issued hundreds of visas in France, putting at stake his own career, were honored in the Museum of the Jewish Heritage (MJH) in New York, in a reception organized by the International Raoul Wallenberg Foundation (RWIF) and the Portuguese and Brazilian Consulates in New York. During the ceremony, Ambassador Felix Rohatyn, who managed to escape from the Nazi Europe at the age of thirteen with a Brazilian passport issued by Souza Dantas, made a very emotional speech, honoring the man who had saved his life. His Excellency Pedro Catarino, Portuguese Ambassador in the United States, attended this event on behalf of the President of his country, Jorge Sampaio. Amongst those present were diplomats of Portugal, Brazil, Germany, Rumania, Hungary, Switzerland, Japan, Chile, Turkey, Angola and Eastern Timor. The lecture on ”Bolívar, San Martín, Latin American Independence and Authoritarianism” took place on the 27th of April 2005 at the Juan Carlos I of Spain Center of New York University, before a distinguished group of students and academicians. In Buenos Aires, on the 5th of April 2005, the International Raoul Wallenberg Foundation honored the mime Marcel Marceau, who saved Jewish children persecuted by the Nazis, for his solidarity and courage shown during the Second World War. The popular French artist received a plaque from Natalio Wengrower, vice president of the IRWF as a memento of his worthy actions. The national meeting for peace, organized by the Argentine Episcopal Committee of Universality, took place on the 18th of April on the esplanade in front of the Faculty of Law of the National University of Buenos Aires; it was an interreligious celebration during which pigeons were let loose as well as balloons containing messages of peace. Monsignor Justo Laguna, President of the Episcopal Committee of Universality, sustained that this encounter ”was drenched with the spirit of Asis,” referring to the meeting of Pope Juan Pablo II with religious leaders of the whole world to dedicate a joint prayer for peace. In February 1999, Bishop Laguna gave a conference in the International Raoul Wallenberg Foundation in Jerusalem. On this occasion, he presented the book entitled ”All roads lead to Jerusalem and to Rome as well,” together with Rabbi Mario Rojzman. The Chancery had to remove a controversial plaque from its building in which homage was paid to 12 Argentine diplomats for their actions in ”favor of Jews” during the Second World War; one of the diplomats is accused by the community’s organization of having done exactly the contrary. The decree N. 999 signed by the Chancellor Rafael Bielsa, arranged for the removal of the plaque placed in the Chancery’s building, as a preventive measure. This decree bears in mind the gravity of the accusation and for ”reasons of its source and institutional responsibility,” he took preventive measures until the committee finished its investigation. This accusation had been impulsed for many years by the Wallenberg Foundation and was aimed against the controversial plaque, which had been inaugurated, with great pomp, by Adalberto Rodriguez Giavarini, at the moment Chancellor, on July 2005. This plaque paid homage to a group of argentine officials who ”stood out during the regime of the Third Reich, thanks to their signs of solidarity and humanity with the Nazi victims”. The life and actions of Carl Lutz (The Just), a diplomat who saved 60.000 Jews in Budapest in 1944, were celebrated before more than 200 diplomats, survivors and other guests. Amongst those present were Mrs. Agnes Hirschi, Lutz´s daughter who had come especially from Switzerland for the occasion; leaders of the Jewish community and diplomats representing Switzerland, Hungary, Belgium, Sweden, Colombia, Guatemala, Brazil, Ecuador, between others. Likewise, many survivors of the Holocaust saved by Carl Lutz were present, including Mr. Michael Vertes who shared his memories of Budapest with the audience. Andrew Simon and Michael Furst, who used to live in the same protective home in Switzerland, met again during the celebration after years of not knowing anything about each other. The International Raoul Wallenberg Foundation congratulated Cardinal Angelo Sodano for having been confirmed in his post as Secretary of the Vatican State by the Pope Benedict XVI, who also named him the Dean of the School of Cardinals. In a special meeting summoned by the International Raoul Wallenberg Foundation´s (IRWF) directives, the Angelo Roncalli International Committee (ARIC) and the Interfaith- Jerusalem Association, which took place in New York, it was reported that the new Pope Benedict XVI had stated his intentions to visit the synagogue in Cologne, Germany, next august. The spirit of brotherhood radiated by the mural in remembrance of the victims of the Holocaust in the Cathedral of Buenos Aires and its replica in the Evangelic Church in Berlin, will celebrate in the near future, the historical visit of Pope Benedict XVI when he visits the synagogue in Cologne, as a symbolic testimony of the dialogue and fraternity that must prevail amidst all human beings, no matter what differences might exist: religious, ethnical, of gender, nationality or language. These are the exact ideals that inspire the activity of the International Raoul Wallenberg Foundation and those of the Angelo Roncalli International Committee. On Wednesday 8thof June, 2005, in the South Reception Room in the Government House, in an act lead by the Argentine President, Néstor Kirchner, the Argentine Chancellor Rafael Bielsa signed the derogation of a secret document, strictly confidential and deeply discriminatory, which had been kept hidden during sixty six years. This was Circular N. 11,one of the jealously guarded secrets by the Argentine State, an order signed in 1938 by the Chancellor José Maria Cantilo and sent to all Argentine delegations throughout the world, to prevent Jews and other people persecuted by the Nazis to enter Argentina. This Circular N. 11 was discovered in 1998 by the Argentine researcher Beatriz Gurevich. Notwithstanding, when she reported her discovery to the authorities of the State Department, the document was archived and most probably destroyed. It was only when the Wallenberg Foundation decided to make public a copy in its Internet website, that Circular 11 began to be known in Argentina and the rest of the world. The International Raoul Wallenberg Foundation cooperated in the functioning of the kindergarten of the Unemployed Workers Movement (UWM) of La Matanza, situated in the locality of Laferrere. One of the leaders of the UWM of La Matanza, Héctor ”Toty” Flores stated recently, ”We have recovered work and dignity, but we are against political patronage”. According to his judgment, if a worker accepts a gift and has to give part of it to a political leader, he loses his moral authority and afterwards he cannot teach his children the path to authentic dignity. The 3rd of June was the commemoration of the 42nd anniversary of the death of Devout Juan XXIII, who will be remembered in history as the Pope who summoned the Vatican Ecumenical Council II, contingency that brought to light the encyclical letter ” Nostra Aetate”. This document emphasized the Jewish root of Christianity, trying to mend centuries of hostility between both religious currents. In the year 2000, the International Raoul Wallenberg Foundation created the Angelo Roncalli International Committee in an act celebrated in the Vatican Delegation to the United Nations, in the presence of the Secretary of the Vatican State, Cardinal Angelo Sodano, in order to render homage to the humanitarian actions displayed by Nuncio Roncalli, later Pope Juan XXIII, to save Jewish refugees persecuted by the Nazi regime during the Second World War. The Angelo Roncalli International Committee is composed by renowned international personalities, such as Cardinal Walter Kasper, Professor André Chouraqui, Cardinal Renato Martino, amongst other public figures. Nuncio Roncalli´s outstanding humanitarian actions to save the lives of thousands of Jewish refugees during the Holocaust, together with his determined attitude of religious rapprochement and dialogue towards Judaism. In his capacity as Pope Juan XXIII, turn him into an undying symbol of love for mankind and of an interreligious colloquial meeting. On the occasion of the commemoration of the 42nd anniversary of the death of Nuncio Angelo Roncalli, the Raoul Wallenberg Foundation in New York was visited by a delegation composed by Mr. Marco Aggazi, Mr. Srinivas P.Ghandi and Mr. Luis Maria Girón from Italy. The visitors brought with them a letter from Monsignor Capovilla, who had been the Private Secretary of Pope Juan XXIII, together with a medal, which was handed over to the founder of RWIF, Mr. Baruch Tenembaum. The Israeli Interfaith Association sponsors the conference by Rabbi David Rosen, international director of interreligious relations of the American Jewish Committee, on the subject ”From one Pope to another: the Catholic church between Juan Pablo II and Benedict XVI, a Jewish point of view”. This conference will take place on the 7th of July, at 19.00 hours in the site of the AJC in Jerusalem. In remembrance of the 120 anniversary of the birth of the Portuguese savior Arístides de Souza Mendes, the International Raoul Wallenberg Foundation held an event commemorating the heroic actions of the diplomat. Mrs. Sheila Fleischacker Abranches, granddaughter of Sousa Mendes, represented his family on this occasion. The Jewish Heritage Museum was the place chosen for the commemoration: a book used by Sousa Mendes to register the thousands of visas issued and the pen that he used to inscribe those names, are on display. The Argentine film LEGACY – I never left my village- sponsored by the IRWF and its associated institutions, Casa Argentina in Jerusalem and the Angelo Roncalli International Committee, was awarded a prize in Berlin due to its humanitarian message of intercultural and interconfessional characteristics. The IRWF summoned the film producers Vivian Imar and Marcelo Trota to direct the film and provided them, as well, with the whereabouts of Jewish colonies dispersed in different countries, including Israel. The story focuses on a chapter of life in the pampas, practically unknown, where Jewish immigrants who were running away from persecutions in Europe, settled down in the beginning of the 29th,century. LEGACY, whose subtitle is significantly ”I never left my village”, describes the newly arrived, most of them with no agricultural experience, who had to start a new life in this country helped by the natives ”criollos” of Catholic faith and who had never met any Jews with a millenary tradition. The Evangelical Church in Berlin, religious Christian community that took the decision of awarding the prize to the film LEGACY emphasizes, in its resolution, the achievements of the argentine interconfessional center with an international projection that financed the production of the film, with the contributions of private collaborators derived from Jewish colonization. The prize to be awarded to the film carries with it significant symbolic contents, whilst at the same time, it reasserts the ideal of cohabitation and Jewish-Christian dialogue in the place where the Nazi genocide, that exterminated millions of Jews, took place. The year 2005 marks the 60thanniversary of Raoul Wallenberg´s disappearance. On the 17th of January 1945, Wallenberg was captured by the soviets and was never seen again. The only person who can solve this mystery and help us to send Wallenberg back home once again, is Russia’s President Vladimir Putin. The International Raoul Wallenberg Foundation has launched a campaign asking everybody to write to President Putin so as to be able to discover the fate of the disappeared Swedish diplomat. An act of remembrance for Raoul Wallenberg was held in Buenos Aires, on the 93rd anniversary of the birth of the greatest saver of human lives in history. The event was organized by the International Raul Wallenberg Foundation (IRWF) in the corner of Figueroa Alcorta and Austria where the monument of the ”Just of Humanity” stands. Together with the President of the Foundation, Father Horacio Moreno, were his Vice President, Natalio Wengrower, as well as Ricardo Faerman and Rabbi Simón Moguilevsky, both members of the Board of Directors of the Wallenberg Foundation. Also present amongst others were Guillermo Nielsen, Financial Secretary of the Nation; Rafael Eldad, the Israeli Ambassador; Alejandro Micula, Rumanian Ambassador; Monseigneur Nicola Girasoli, Apostolic Nunciature; Stefan Schlütter, German Embassy; Zolta Baca, Hungarian Embassy; Samuel Ossa Dietrich, Chilean Embassy; Isabela Matusz, Polish Embassy; the President of the political party ”Unión para todos”, Patricia Bullrich; the leader of the ”Movement of the Unemployed Workers of La Matanza, Toti Flores; Jorge Kirszembaum, President of the DAIA; Mario Feberbaum, President of the Foundation Memory of the Holocaust; Mario Ringler, President of the Rabinic Latin American Seminary; Marshall Meyer, pedagogue and survivor of the Holocaust; Jack Fuchs and those saved by Wallenberg in Hungary, Mr Tomás Kertesz and Laszlo Ladanyl. For the first time the Wallenberg Foundation remembered a Catholic priest according to the date of the Hebrew Calendar, on the 3d of av 5765 (august 2005). As every year the Wallenberg Foundation remembered the birth anniversary of the Argentine Primate Cardinal, Antonio Quarracino. The act of remembrance took place by the Cardinal’s grave, in the Chapel of the Virgin of Luján, in the Metropolitan Cathedral of Buenos Aires, next to the commemorative Mural for the victims of the Holocaust and the victims of the criminal attacks against the Israeli Embassy and the AMIA. Santa Fe renders homage to Baruch Tenembaum. 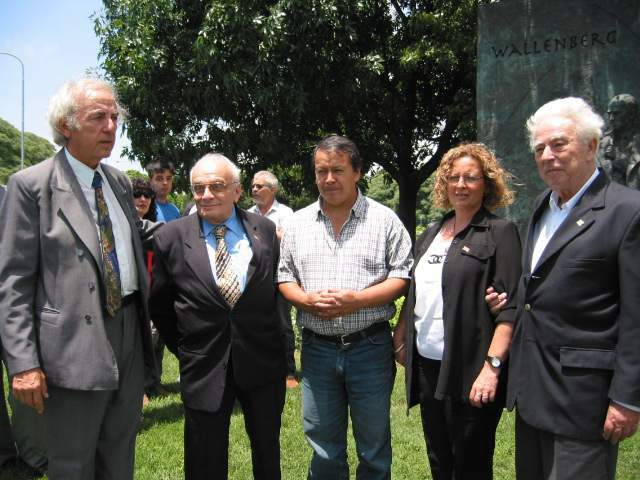 On September 29th 2005, at a meeting in the White Reception Room of Santa Fe´s Government building, the Governor Jorge Obeid handed the title of Illustrious Citizen of that Province to Baruch Tenembaum, founder of the International Raoul Wallenberg Foundation. The Mexican diplomat Gilberto Bosques was honored in a ceremony organized by the General Consulate of Mexico in New York and the International Raoul Wallenberg Foundation. Many important diplomats, leaders of the Jewish community and members of the Latin community, attended this celebration. Gilberto Bosques, General Consul of Mexico in Marseille, France, during the years of the Nazi occupation, favored the escape to Mexico of a great number of Jews and other persecuted people of different origins. During the event, the guests had the opportunity to meet Jacqueline and Doris Weitz. Daughters of Herman Weitz, who had received one of the many visas issued by Bosques, thus saving his life. The Weitz sisters traveled especially from Los Angeles to render homage and express their gratitude to the Mexican savior and to the people of Mexico who had made it possible for their family to start a new life. A group of volunteers of the International Raoul Wallenberg Foundation, who search for people that helped Jews persecuted by the Nazis during the Holocaust, honored Lela Sopianac, a Croatian lady who has just turned 90, and who hid forty Jewish families in her house in Zagreb during the Second World War. The grandmother arrived in Argentina in 1940, escaping from the Nazis. Due to her activity, she was sent to a concentration camp together with her husband. As a result of all the tortures inflicted on her, she lost a kidney and the thumb of her right hand. When they were taking her to the Croatian frontier with Italy to execute her, she escaped and immigrated to Argentina. Lela says ”my house was open to all my brothers and sisters, you can’t say he is Jewish or the other one is a Christian. One must put in practice God’s Word, which is one and only word for everybody”. ”The Optimists,” that narrates the story of the rescue of Bulgarian Jews during the Holocaust. This event was sponsored by the Israeli General Consulate in New York, the General Consulate of Bulgaria in New York, the American Society of Yad Vashem, the Jewish American Committee, the American Sephardic Federation, the Center for Jewish History and organized in collaboration with the International Raoul Wallenberg Foundation. The Wallenberg Foundation rendered homage to sister Rose Therin for her untiring work in promoting Jewish-Christian Dialogue. During the celebration in the Museum of Jewish Heritage in New York, on Sunday October 16th 2005, after the screening of the documentary film ”The Passion of Sister Rose,” based on her life. During the year 2002, in the midst of a political, economical and social crisis, the educational program ”Raoul Wallenberg at school” began to develop in Argentina, thanks to the initiative of the International Raoul Wallenberg Foundation. It is addressed to young people and its objective is to build a space in which to learn and spread fundamental values, so as to consolidate a pluralist and democratic citizenship. The renowned artist Susi Cantarino is going to create a painting inspired on the Brazilian diplomat Luis Martin de Souza Dantas, who saved 800 lives from Nazi persecutions during the Second World War. Ms. Cantarino volunteered to create this piece following a request launched by the International Raoul Wallenberg Foundation, who wants the art world to express the spirit of the Brazilian hero. The artist, who lives in Brazil, is already working on this project. For the first time, an Argentine province dedicated a day to commemorate Raoul Wallenberg, the Swedish diplomat savior of tens of thousands of people persecuted during the Holocaust. The Governor of Corrientes, Ricardo Colombí, declared October 5th of each year as a day dedicated to Wallenberg´s memory. The States of New York, Connecticut, Michigan, Nebraska, Maryland and Nevada declared the 5th of October as the official Raoul Wallenberg Day, following the suggestion of the International Raoul Wallenberg Foundation. The educational program ”Wallenberg at school” has completed its fourth consecutive year. To end a cycle of intense activities during the year 2005, the group of volunteers of the International Raoul Wallenberg Foundation made a toast in the site of the institution in Buenos Aires. The documentary film ”Legacy- I never left my village,” produced by the International Raoul Wallenberg Foundation and based on an idea of its founder, Baruch Tenembaum, was distinguished on November 30th by the Israeli Argentine Mutual Benefit Association (AMIA), during an act that took place in the main auditorium of the central Jewish Argentine community. The International Raoul Wallenberg Foundation greets new members. Roland Koch, Minister President of Hessen, Germany; Renate Kuenast, Minister of Consumer Protection, Food and Agriculture, Germany; Pearlette Louisy, Governor General of Saint Lucia; Jack McConnell, First Minister of Scotland; Enrique Múgica Herzog, Ombudsman of Spain; Zurab Nogaideli, Prime Minister of Georgia; Juergen Ruettgers, Minister President of Nordrhein-Westfahlen, Germany; Konstantin Saxe-Coburg-Gotha, Director of Rothschild Spain; Otto Schily, Former Minister of Interior of Germany; Renate Schmidt, Minister for Family Affairs, Senior Citizens, Women and Youth; Heide Simonis, Minister President of Schleswig-Holstein, Germany; Peter Struck, Former Minister of Defense, Germany; Vasile Tarlev, Prime Minister of the Republic of Moldova, and Brigitte Zypries, Minister of Finance of Germany. Carlos Alvarez, Mayor of Miami, USA; Alfonso Alonso Aranegui, Mayor of Vitoria Gasteiz, Spain; Phil Bateman, Mayor of Wolverhampton, United Kingdom; Juan del Granado Cosio, Mayor of La Paz, Bolivia; Paco Moncayo Gallegos, Mayor of Quito, Ecuador; Alain Juppé, Mayor of Bordeaux, France; Fabienne Keller, Mayor of Strasbourg, France; Petra Roth, Mayor of Frankfurt, Germany; Joe Mitchinson, Mayor of Gateshead, United Kingdom; Karlheinz Ospelt, Mayor of Vaduz, Liechtenstein; Kerry Prendergast, Mayor of Wellington, New Zealand, and Darren Ray, Mayor of Port Phillip, Australia.